One of the most interesting and exciting casual games this month was most certainly Mushroom Shoot. Since it is one of the most played games this month in our office, and since it provides with challenging and unique gameplay for all Android users, we pronounce it as our Casual Game of the Month! See why below. What is Mushroom Shoot all about? The Mushroom Shoot is one casual game which is very addictive and entertaining, especially developed for android users, that offers them to have fun while shooting and testing their skills. Easy for playing and suitable for adults and kids the game allows users to enjoy the colorful high-quality design with entertaining shooting sounds in the background when they play. 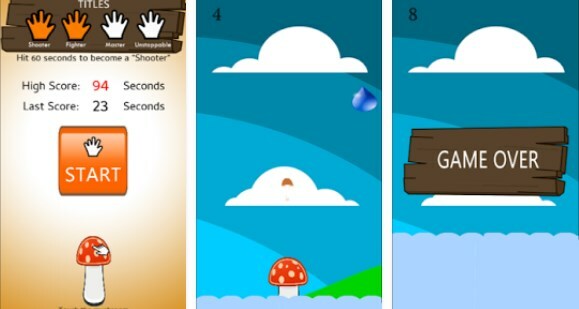 The game will keep players addicted each time they play giving them a simple task to keep the mushroom alive from the flood by shooting the rain drops that are falling. The casual android game is allowing players to have endless fun while shooting and challenging their fast reactions, keeping the mushroom safe. With playing the game, players will constantly be interested in the gameplay, challenging them and letting them have fun. The gameplay offered is very simple but yet highly entertaining. The player on the game has one task he needs to do. Players must keep the mushroom alive, shooting the rain drops, preventing them to flood the mushroom. With touching the screen, the players can move the mushroom up and down, shooting the rain drops with tiny mushrooms. The game will end when the flood is covering the whole mushroom and the player will need to start playing all over again. As many seconds as players can, they need to keep the mushroom alive, and the players will the best results will get titles for their achievements on the game. Download the game on Google Play now for free.